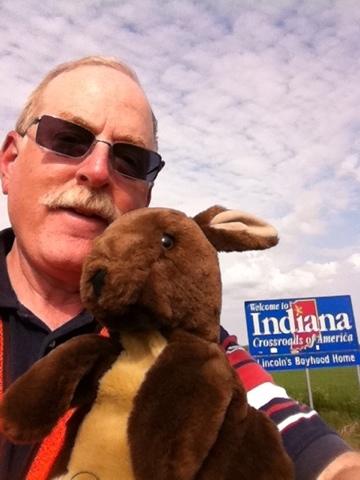 It didn’t take us long this morning to reach the Indiana line. I am in the photo for a change because there was a handy highway marker pole, just right to go up my puppet backside, freeing Jeffrey to operate the camera on his iPhone. 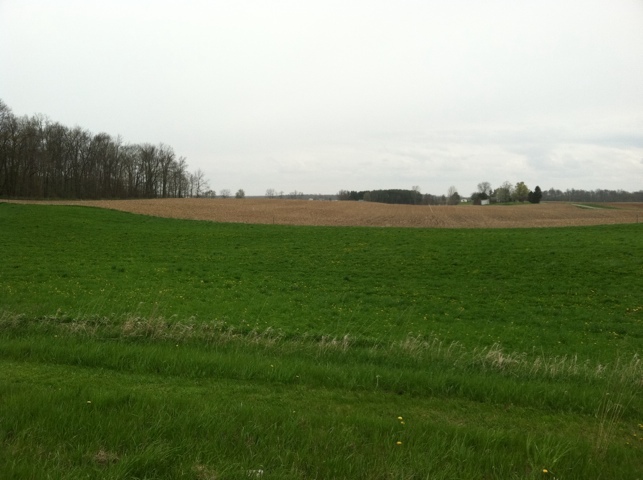 Far NW Ohio and far NE Indiana are not quite as flat as yesterday’s Ohio route. We encountered something less than rolling hills but more than undulations. After a while, things flattened out again. We stopped at a bike shop in Angola for a nut to replace one that dropped off a brake lever — no charge. Then we took the proprietor’s suggestion for breakfast at a deli. Well, lunch, really. Jeffrey had a delicious grilled cheese sandwich and some exquisite homemade meatless potato soup. The folks behind the counter were very interested in the Ride, and said they would check out this blog. Some might find it strange that people in a small homogeneous town would care about refugee rights. But it’s not so strange. The deli has a sign near the door with a citation of “Scripture of the Day”. Today it was a passage from Matthew. People who care that much about their Bible take seriously what it says about helping those in need. 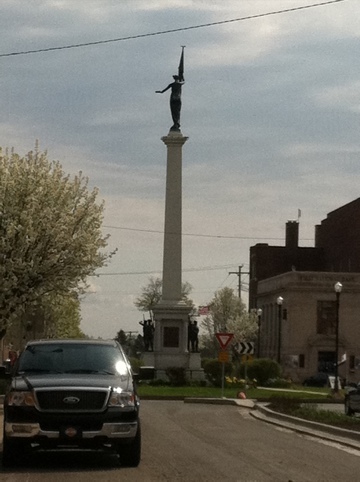 Here’s a snapshot of the memorial column in Angola’s charming town square. Remember, we set out from NYC, a city in which a third of the residents are foreign-born. We crossed New Jersey, a diverse state filled with church services, shops and signs in multiple languages. But when we got to rural Pennsylvania, and then rural Ohio, the only distinctly “foreign” people we encountered were three of our hoteliers, all from the same Indian state. That’s not to say there were no foreign-born in the places we visited. But we didn’t see them. 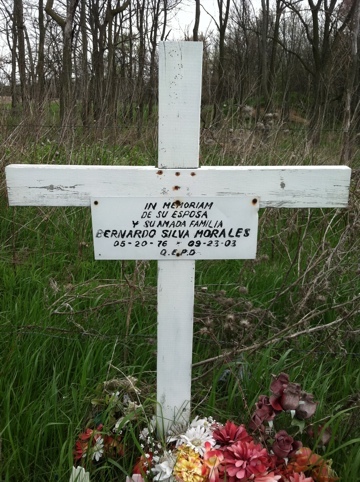 A memorial cross lettered in Spanish? 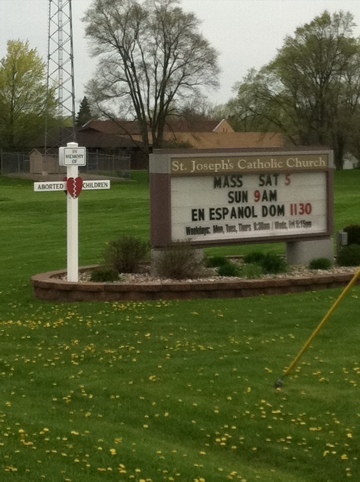 A weekly Catholic Mass in Spanish? Sounds like the vanguard of an invasion! You know those “Mexicans”. (Americans often apply that moniker to people from diverse nations and cultures who happen to speak Spanish.) They keep to themselves. They don’t assimilate. They aren’t part of the general community. They may destroy Indiana and the USA as we know them! But wait. What about the Amish? Now lemme get this straight. Many Americans don’t want people around who keep to themselves, don’t serve in the military, don’t make a lot of money so don’t pay much in taxes, have many children, stick to their special clothes and foods, and clog up the roads even while refusing to get driver licenses. That’s the Amish to a T! What’s more, they consume a lot of public services. 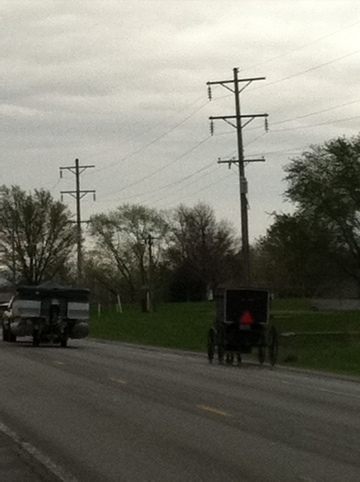 No, they don’t crowd public high schools, but they require special accommodation on the roads (we like to bicycle on those wide shoulders, but the shoulders were built for buggies, not bikes), and Amish marrying only within their small community gives them a high rate of some genetic diseases that are treated at public expense. So . 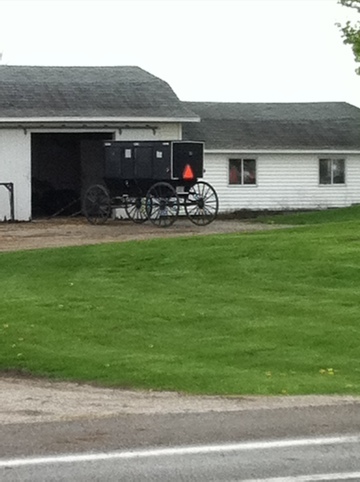 . . what is it about the Amish that makes the American general public accept or benignly ignore the existing Amish community, while getting into a flap about a supposed “Mexican invasion” of hard workers and their families? Oh, you say, there are few Amish and they happen to be America-born, while there are millions of unauthorized immigrants in the U.S.! Well, yes. And all the unauthorized immigrants together, including Mexicans and Japanese and Swedes and Canadians, including children who are as American as we are except for the paperwork, constitute about 3% of U.S. residents. If they are 3%, that means the rest of us are 97%. Seems like we Real Americans hold a slight numerical edge. Maybe the “Mexicans” pose no more of a threat to our ways (plural) of life than do the Amish. Maybe we can afford to live and let live. 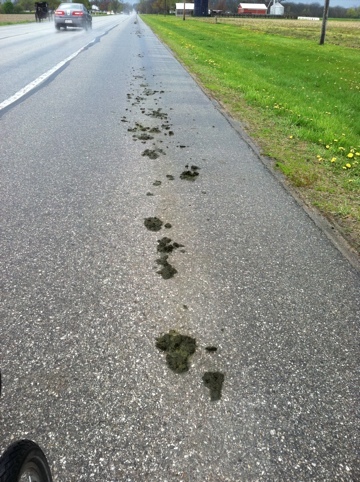 This entry was posted in Bicycle Touring, Human Rights, Immigration and tagged Amish, horse apples by Joey. Bookmark the permalink.